Okinawa Prefecture (沖縄県, Okinawa-ken, Okinawan: Uchinaa-ken) is traditionally a prefecture in the Kyūshū region of Japan. Okinawa Prefecture is made up of islands which are southwest of the island of Kyushu. Recent government proposals recognize the prefecture as its own region. The capital city is Naha which is on the island of Okinawa. 1879 (Meiji 12): Okinawa Prefecture was established. Okinawa is a grouping of many islands along the border at the edge of the East China Sea and the Pacific Ocean from Kyūshū to Taiwan. It is the southernmost prefecture in Japan. 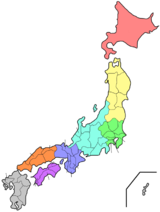 Okinawa Prefecture has eleven cities. Okinawan names are in parentheses. National Parks are established in about 19% of the total land area of the prefecture. Naminouegū was the chief Shinto shrine (ichinomiya) of the Ryukyu Islands. In 1890, the shrine was recognized in the system of State Shinto. It is among the ranked, nationally significant shrines or Kanpei-shōsha (官幣小社) which includes five sanctuaries. ↑ 2.0 2.1 Nussbaum, Louis-Frédéric. (2005). "Okinawa-ken" in Japan Encyclopedia, pp. 746-747. ↑ Nussbaum, "Naha" at p. 686. ↑ 5.0 5.1 5.2 Nussbaum, "Ryukyu Islands" at p. 801. ↑ Japan, Ministry of Foreign Affairs (MOFA): 26th G8 summit, overview. ↑ Ponsonby-Fane, Richard. (1959). The Imperial House of Japan, p. 127. ↑ List of Kankokuheisha (官国幣社), p. 3; retrieved 2012-8-26.